I would assume that you have already planned what you are serving for Christmas dinner next week. We are a very small group this year so it makes it pretty easy to know what I am serving. 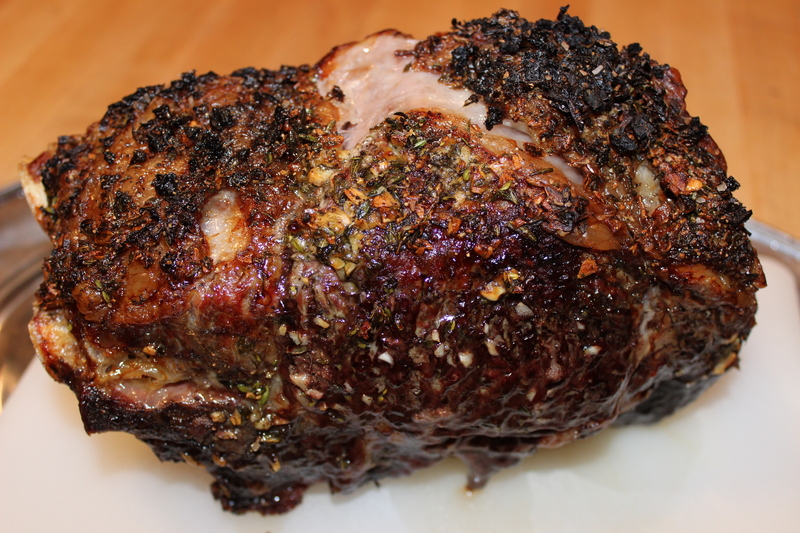 The scrumptious garlic herb Roast Beef. It is far more affordable when there are just a few versus a large crowd. If we were having more people I would probably opt for a Ham since we just had Turkey a few weeks ago. Though I did buy a monster roast a few years ago for a crowd. The price actually scared me! This weekend is our annual Christmas party; while the New Hampshire weather hasn’t really cooperated the party is still on and I spent 3 days prepping for it. I spent a day shopping, another prepping and the final putting it all together. We tend to have around 30-50 people singing in the living room, eating in the dining room and drinking all over the house. The snow has stopped and my husband is out plowing now so hopefully he will be able to socialize with all of our friends and family. I am technically re-posting pictures and the recipe from one of my blogs from 3 years ago. To date it is my most viewed blog. It was so startling that I thought there was something wrong with computer. To date it has had over 1,200 views; which to little ole me is something pretty spectacular. Take the roast out of the fridge at least 30 minutes before you want to cook it. If you can season it up to 2 hours before. Make a paste out of the garlic, salt and a tablespoon of the olive oil. Add the chopped thyme and more oil as needed. Salt and pepper the roast and then cover it with the garlic herb mixture. Cook uncovered until the internal temperature reaches about 125’F for medium rare, let it rest for at least 15 minutes before you slice into it. If you have someone that doesn’t like it medium rare, you can take a few slices and cook them a little longer in the delicious gravy you’ve made with the pan drippings.